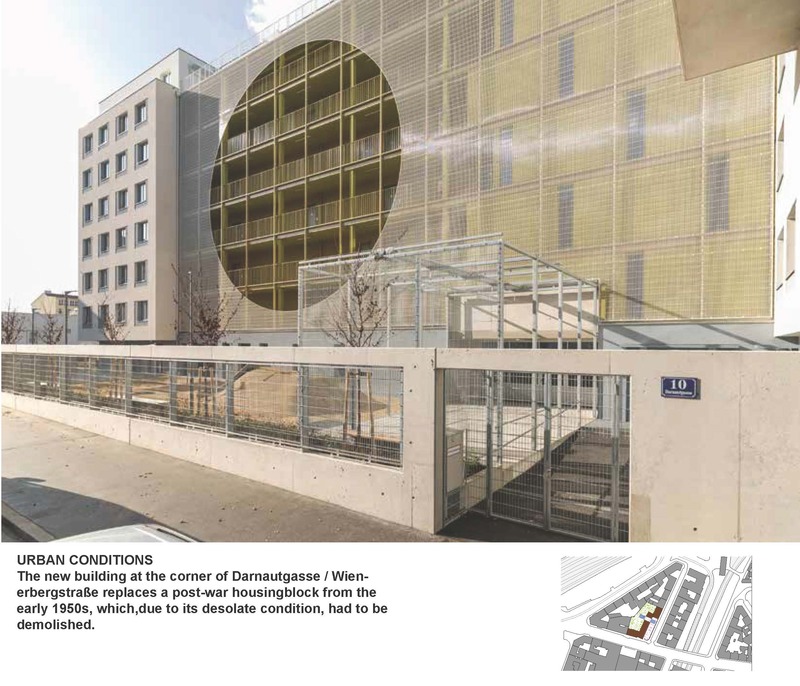 Building Cost = Total Bulding Cost / Gross Area: 481,80 €/ sq.m. 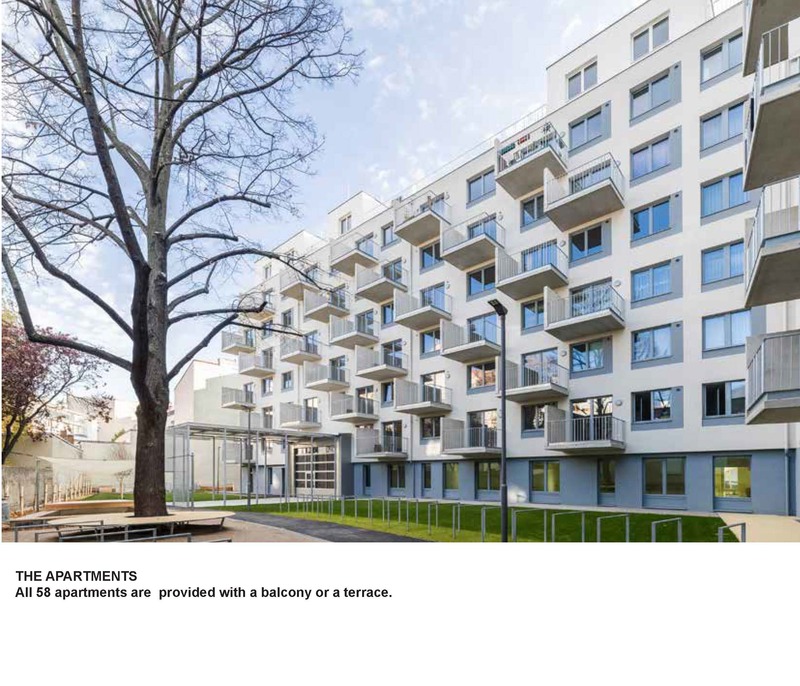 Rules of allocation: Vienna Housing Subsidies Law:defines a maximum for the cost of construction and the rent. 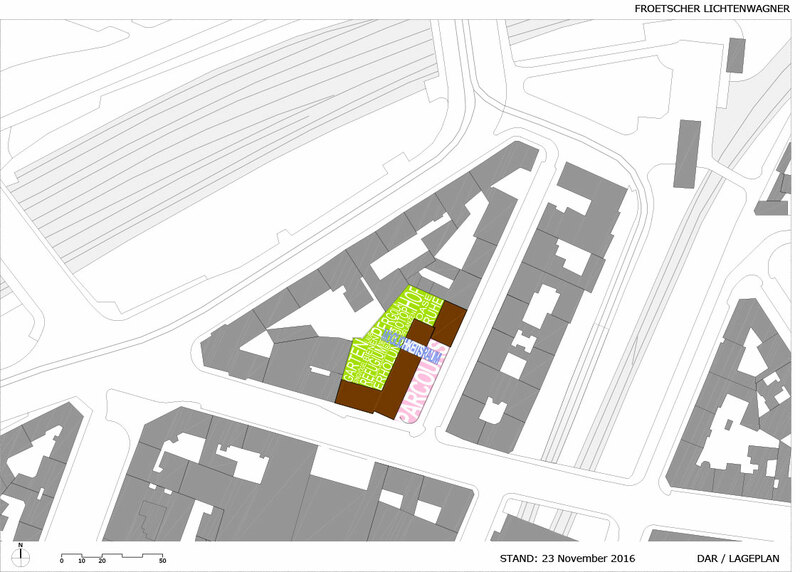 more shared flats, 26 smart flats (extra subsidised) and 27 regular flats. Involvement of inhabitants in the building process: ROOM OF OPTIONS: Process of taking possession. 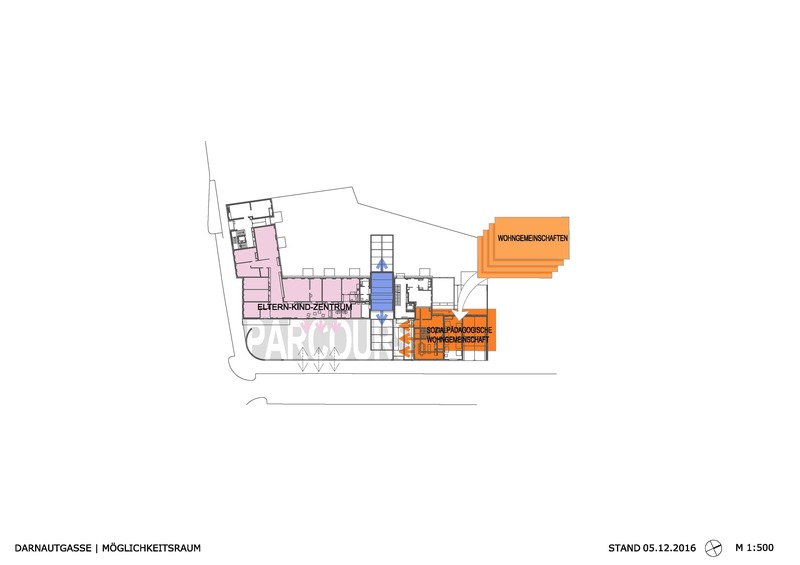 In a process, moderated by sociologist, the new tenants will develop rules of use and an interior layout. 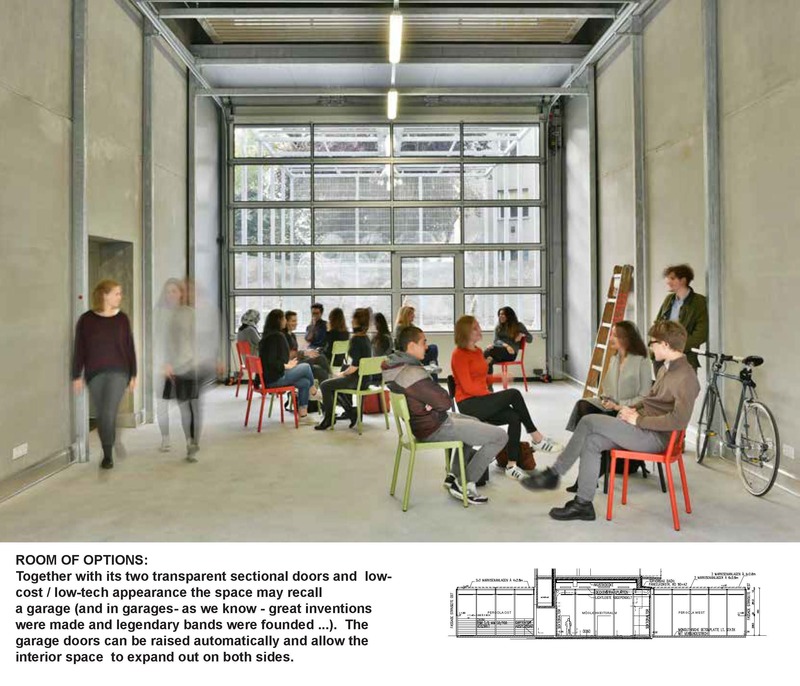 Community accompaniment in the life of the building: In a process (more than one year), moderated by sociologist, the new tenants will develop rules of use and an interior layout. 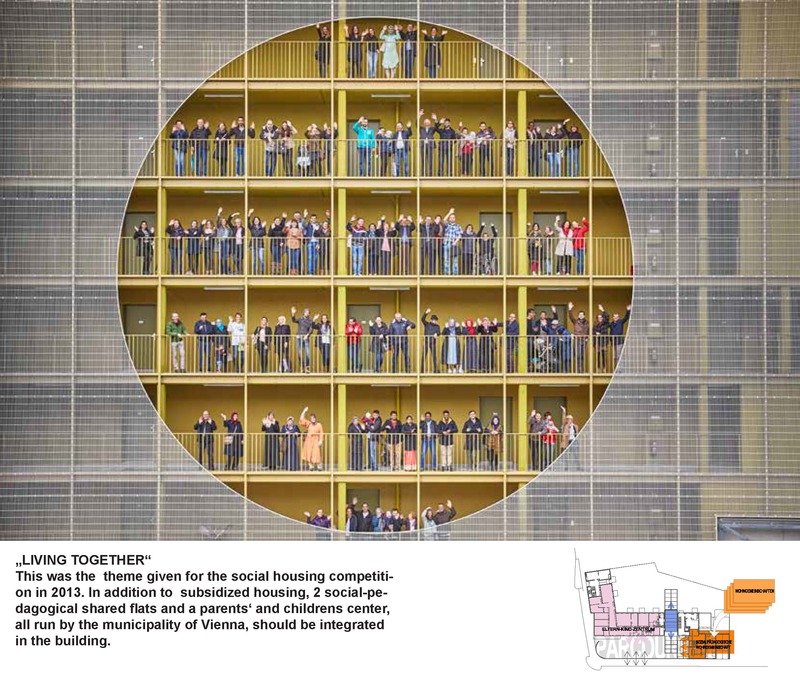 Functional mixitè: “LIVING TOGETHER” This was the theme given for the social housing competition in 2013. 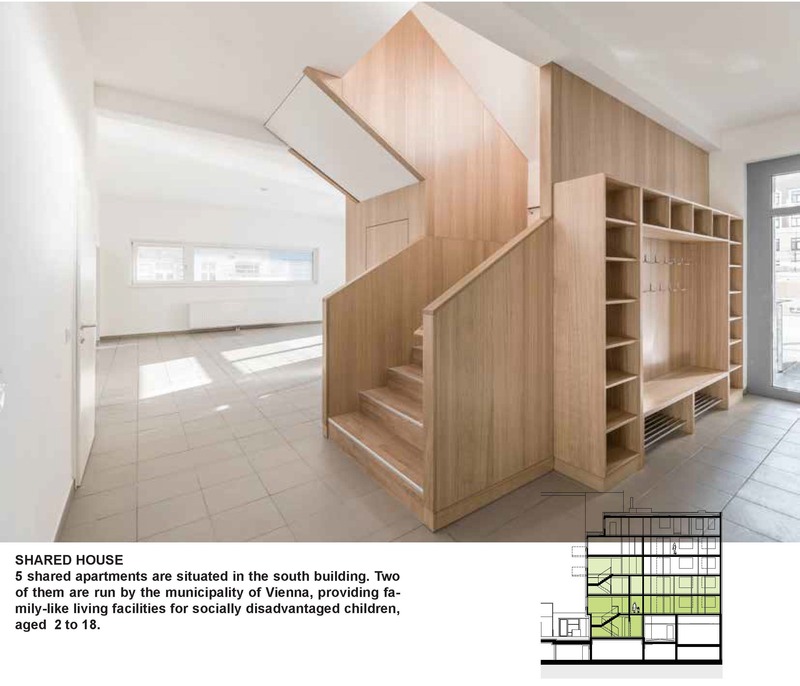 In addition to subsidized housing, 2 social-pedagogical shared flats and a parents’ and children’s center should be integrated in the building. Common spaces and shared living: ROOM OF OPTIONS. 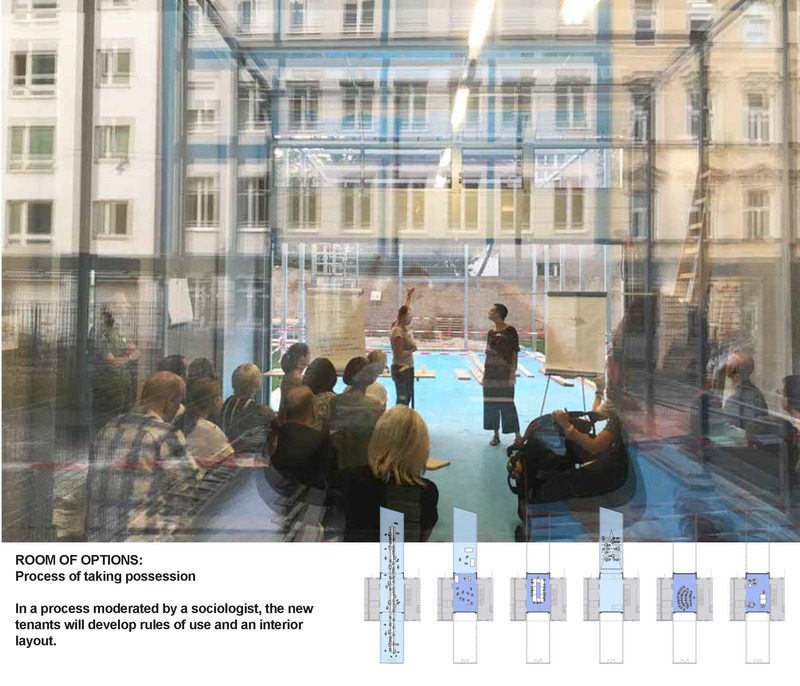 For all these different user groups with their different needs, the concept of the Room of Options was developed. It also can open to the public. The new building at the corner of Darnautgasse / Wienerbergstraße replaces a post-war housingblock from the early 1950s, which,due to its desolate condition, had to be demolished. This was the theme given for the social housing competition in 2013. 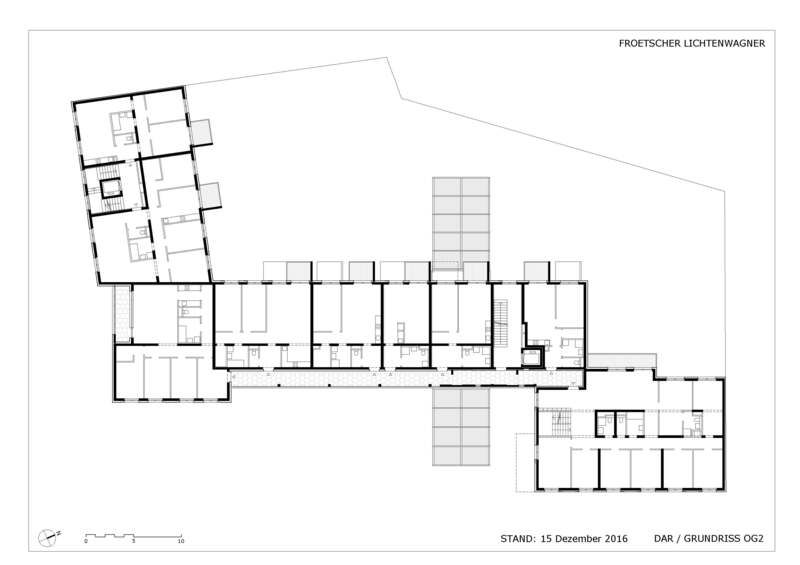 In addition to subsidized housing, 2 social-pedagogical shared flats and a parents‘ and childrens center, all run by the municipality of Vienna, should be integrated in the building. 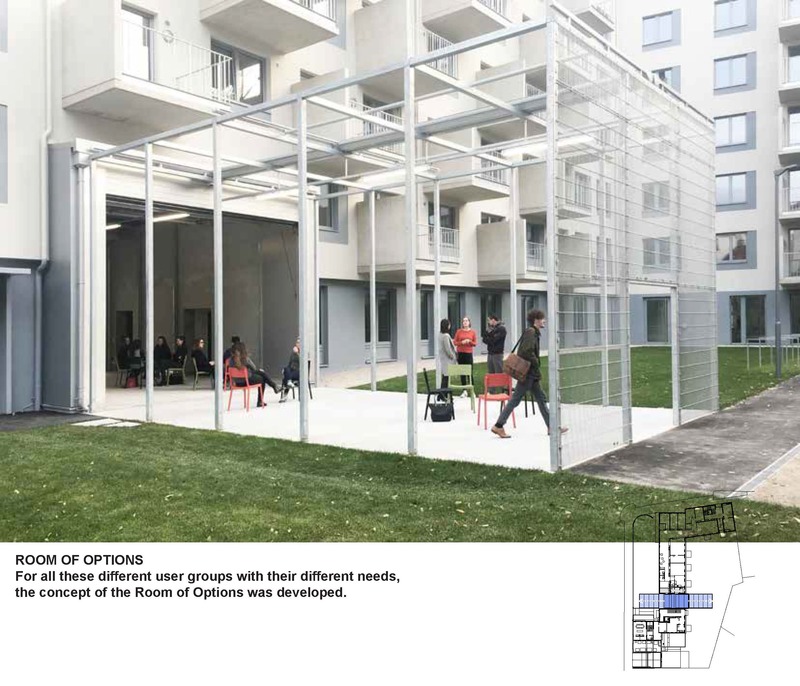 For all these different user groups with their different needs, the concept of the Room of Options was developed. Together with its two transparent sectional doors and low-cost / low-tech appearance the space may recall a garage (and in garages- as we know – great inventions were made and legendary bands were founded …). The garage doors can be raised automatically and allow the interior space to expand out on both sides. 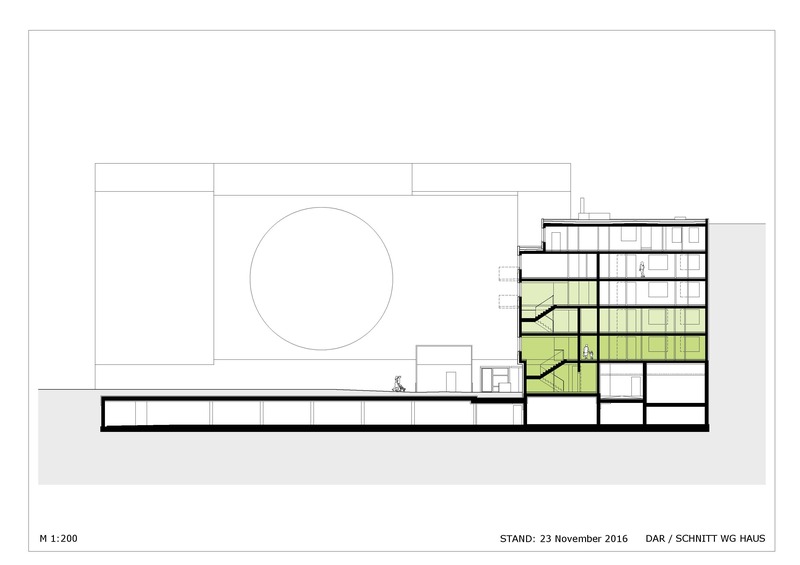 In a process moderated by a sociologist, the new tenants will develop rules of use and an interior layout. Counselling and meeting point for parents and parents-to-be. 5 shared apartments are situated in the south building. 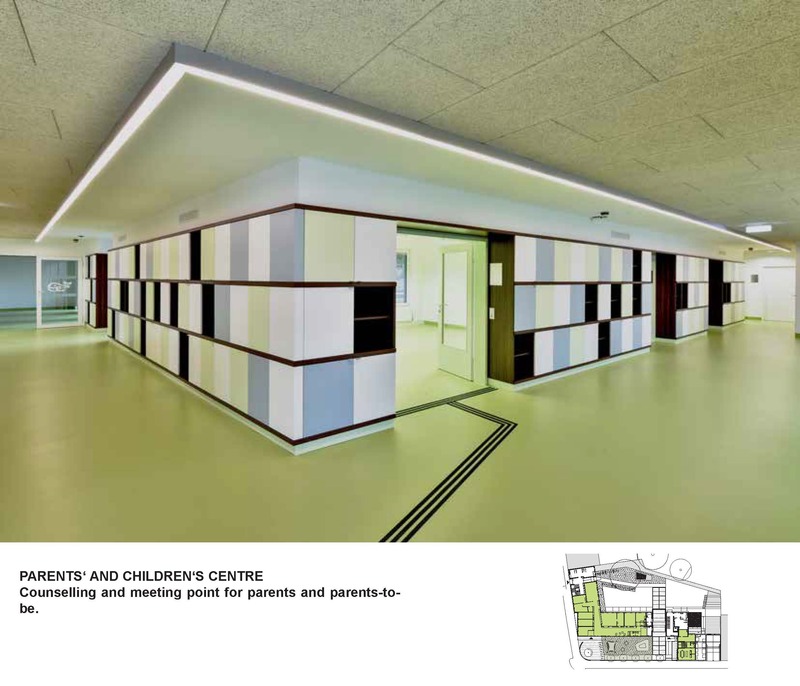 Two of them are run by the municipality of Vienna, providing family-like living facilities for socially disadvantaged children, aged 2 to 18. Loud to loud! 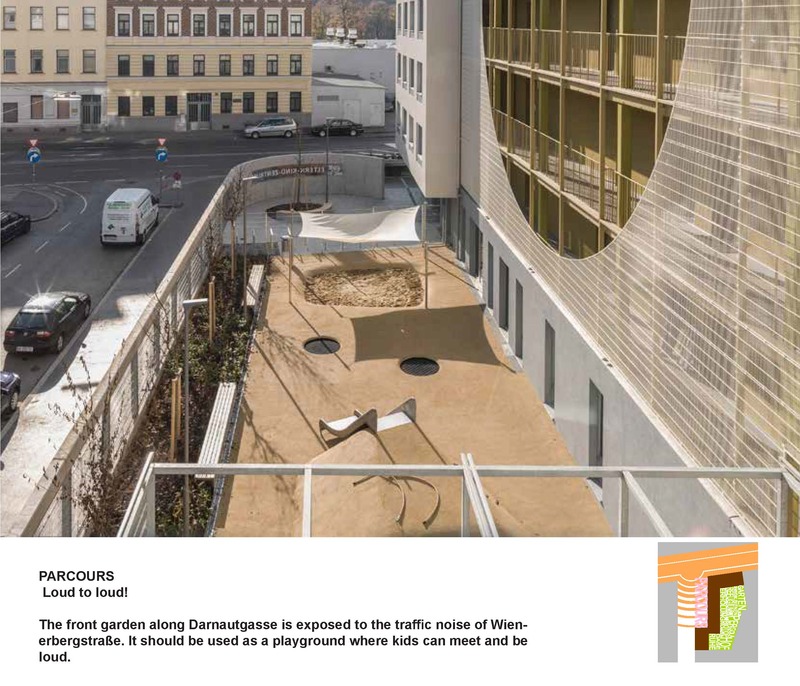 The front garden along Darnautgasse is exposed to the traffic noise of Wienerbergstraße. It should be used as a playground where kids can meet and be loud.